More and more businesses are feeling the pressure to do something with social media. There is a lot you can do. Here’s an example of what you can do in the B2B space: read about our award-winning social media entry in the American Marketing Association’s Marketing Excellence Awards. In fact, there is so much to do with social media that it can be overwhelming. Remember: focus on your audience. Whether it’s by geographic region, behavioural segment, age or interest. Putting your audience first answers a lot of questions. If your competition is using social media and you are not, it is probably time to take the plunge. We’ll show you some of the ropes with this social media marketing guide for small business. Contact us if you have any questions. We’re big fans of research. We have entire articles devoted to research you can use in your social media marketing plans here and here. The research presented below is distinct from research appearing elsewhere on this site. For newcomers and others not familiar with how to get started with social media, welcome to our social media marketing guide. We will walk you through how social media marketing can replace many modes of paid advertising and media. The fact is, social media often accomplishes the same thing as advertising but at a much lower cost. Low cost, however, is not free. If you plan to handle your social media without outside assistance, you will soon become aware of the time it takes to write and post content. It’s time consuming! If it isn’t time consuming you’re doing something wrong. Or, you are running ads! Running ads is actually the best way to quickly reach people and is fairly low cost. Here’s our page on Instagram and other social media ads. With social ads, you decide how much you want to spend; there’s no “minimum spend”. This is great for doing test pilots. You also have to factor in photography, design, and other forms of creative production. These elements can range anywhere from next to nothing to a huge expense, depending on how you approach your content creation. Considering that anywhere you would advertise you’d need artwork or some form of promotional content, the cost to generate content on social media are table stakes. The clear advantage social media offers over other forms of media is that it is a two-way communication platform. It’s the same as being on the phone with someone or corresponding by email. As a way to engage potential customers, social media can be a great way to go. Social media can also influence your Google and Bing search results so that your business is likely to rank higher when people search for your business or something related to your business. For small businesses social media marketing can replace many modes of paid advertising and media. The fact is, social media does the exact same thing as advertising but in many cases it is totally free. The difference between social media and traditional advertising is that traditional advertising has a built-in audience. You pay a radio station to run ads because they have access to ten thousand people in the morning when those people are driving to work. With social media you can also pay for a built-in audience, but you also have the (important) option to grow your own audience. When you grow your own audience, this is known as organic growth. It’s organic because you haven’t paid someone else to lend you the audience for a period of time. Organic media is the parent of something known as earned media. We recommend growing your audience organically and then filling in with paid support at key times if you need some extra oomph (you might want to try a paid campaign during the holidays or before a big wine festival, for example). This is the boring part. Take a picture of yourself and a photo of your business. Start an account on Twitter and try to obtain your own name. Try to avoid anything that includes numbers or underscores. For example, if you have a plumbing company try to use the plumbing company name only. Use @westhillplumbing, not @westhillplumb45. We set up all types of social media accounts for a very modest cost and handle all of the artwork and registration. Pro Tip: Don’t have access to Photoshop? Use Canva to create graphics for your social media accounts. Register on other networks besides Twitter. Definitely grab an Instagram account as well as a Facebook and a Google My Business page. While you’re on Google, grab a Google Plus page, too. For most businesses, LinkedIn can also be helpful. Especially if you are a sales representative, fitness trainer, real estate or another consultant that works one-on-one with people. Once you have successfully registered on all of the platforms, be sure to verify your account so they know the account is legitimate. (LinkedIn eventually lets you replace your temporary username with one of your choosing). The people at Google are smart, so Google Plus allows you to verify from the get-go. They mail a PIN to the address you provide. It takes a few weeks to be verified on Facebook but they are pretty cordial about the whole process. Twitter is a different story. Don’t feel bad if Twitter does not verify you. Twitter verifies very few accounts, and the verification process varies by region and is not transparent. Even if you don’t use all of the social channels it is a good idea to register them to protect your name. It is very hard to get your name if someone has already taken it. Every small business is well advised to grow a local audience. What’s important to remember is that people know other people — there are connections between people who may seem unrelated. For this reason, you may not think a person in your audience may be a good fit but they may be connected to someone who is. This concept is important because of the way social media works. Let’s say you are a construction company or work with construction companies. Your goal is to attract new clients. One of your first steps would be to develop an audience in your city and the places where you operate. Audience development is another way to say “grow your followers.” On the way to growing your audience you will attract followers who also work in construction. And followers who are married to people who work in construction. And friends of people who are involved with construction. You get the idea. Growing your audience is an imperfect science but that’s a good thing! Randomness introduces opportunity. Keep this in mind: when someone “likes” or comments on one of your posts, their friends get notified that they liked something that you did. This is why it is a good idea to attract followers who tend to have big audiences and like things on social media even though they may not appear to be 100% relevant. This is why a construction company should pursue the widest local audience possible. 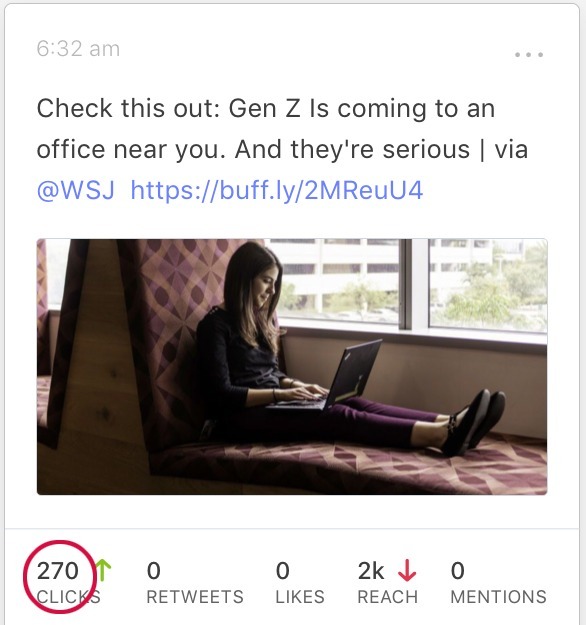 Similar to the local newspaper that gets left behind at a Starbucks only to be read by 20 different people throughout the day, a social media post can reach huge audiences in an instant. This tweet below got 270 clicks on a Wednesday morning. You might think that’s not a big deal but 270 clicks translates to 14% of her audience. If you can get people to share your content or interact with it in some way, that’s when things start to get interesting. What’s the best way to grow your audience on social media? For starters, follow everyone who lives in your area. You can search a hashtag to find tweets from anyone who has tweeted about Seattle, for example. You can then follow these people. Iif you live in Seattle, search for #seattle. If you live in Timbuctu, search for #moosejaw. When people first start on social media it is tempting to follow people in your same business (anyone who has the #plumbing hashtag, to use the above example), but this leads you to competition. Normal people (not competitors) need plumbing so it is good to follow people who are following local media outlets. That is the best approach to building a quick local audience. There are no shortage of people following CBC Saskatoon or The Globe and Mail. Heck, follow everyone you can find if they live in an area where they could be customers. Growing your audience will take time but it is well worth it because in the end you will have a virtual stadium full of people that you can message to. With help growing your audience, please refer to this article. Step 3: Start Posting. Regularly. This is when every small business wants to know: what do I possibly post each and every day multiple times a day? This is where small businesses really need help with social media. Automated, pre-programmed content: you can use DrumUp, Crate, and Feedly to find and schedule content. Feedly works with Buffer, a first-rate (and free) scheduling program. You can (and should) tweet while you sleep. You would be amazed at how many people are up at 1 am spending time on Twitter and Facebook. Not to mention Instagram and LinkedIn! Curated content: The third and most popular type of content is content that you share but which has been published first somewhere else. This can be remarkably effective and is one of the only ways you can keep a feed busy if you don’t have endlessly deep content or tons of adoring fans to submit their own content.The good news is that there is no shortage of content from which to choose, so curate wisely! It is best to avoid political debates and common PR traps such as those posed by celebrities in rehab. In the beginning it will seem as if you are all alone in the world, posting messages that no one is listening to. Don’t fret. They will come. Depending on how aggressively you pursue audience development, it may not be important to start measuring your progress until the third or fourth month. I will just warn you right now that regardless of how many Facebook friends you have, Facebook will not show your content unless you pay them. This is why Twitter and the other platforms are a good alternative until such time that you get comfortable running ads and tweaking your creative for certain audiences. Twitter has excellent built-in analytics but if you need a more comprehensive overview, Google Analytics is a powerful free option.